By John Stewart, President, QP Consulting, Inc. 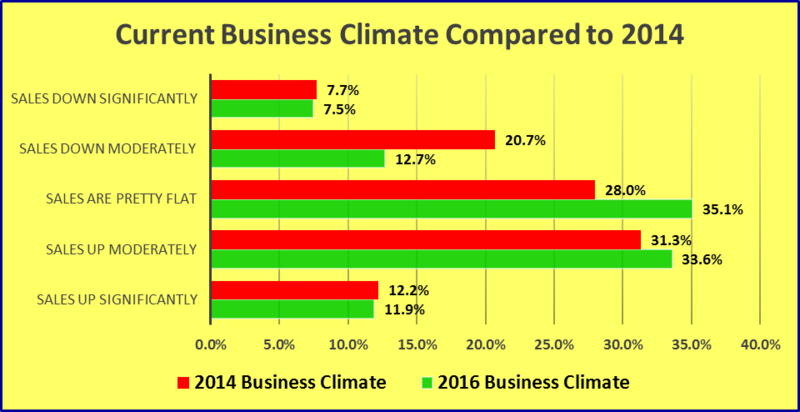 Approximately 18 months ago (August 2014) we conducted a survey on behalf of NPOA titled, titled, “Down to Earth, No Punches Pulled” – a general business climate survey. In August of 2014, approximately 28% of owners reported that sales were down either moderately or significantly. Move ahead 18 months and we find that number has improved, but only modestly! Today, approximately 20% of respondents are still reporting that their sales continue to be down. 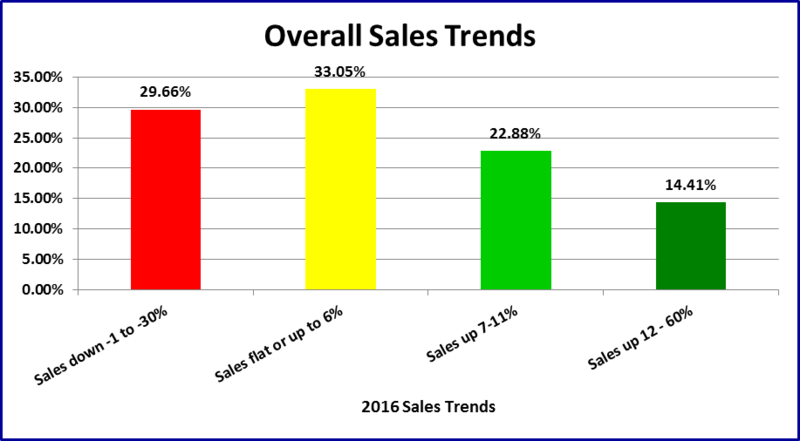 Unfortunately however, as you can see from the chart below, the percentage of firms reporting to us that sales are “pretty flat” has actually increased from the 28% reported in 2014 to 35% in Feb. 2016. That means that approximately 55% of our industry is still struggling to some degree and telling us that their sales are either “down” or “flat” as we head into the remainder of 2016. Nonetheless and on the “brighter” side, approximately 46% of our current survey respondents told us that sales were up either “moderately” or “significantly” as we head into the remainder of 2016. This percentage is close to the approximately 44% of respondents reporting similar trends in August 2014. Independents vs. Franchise – Independents represented approximately 85% of the responses received, with franchises accounting for 23% of our responses. Approximately 2% of responses came from “in-plant” operations. 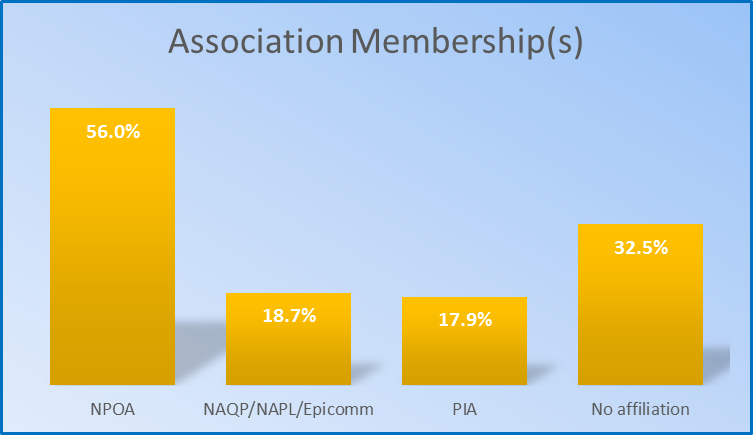 Trade Association Membership – As we do in most of industry surveys, we asked participants to indicate their affiliations or memberships in industry trade associations. 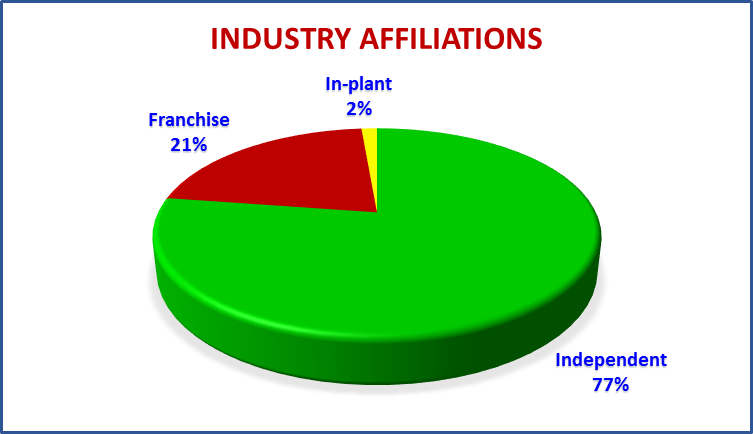 The chart below illustrates those affiliations. Annual Sales – Survey participants were asked to provide their annual sales for the purposes of special extractions and data comparisons, and while the question was optional, almost 85% provided us the requested data. It appears that our average survey participant, as a group, appear to be projecting 2016 sales will be up approximately 10%, which is indeed refreshing after going through a lengthy period of time when average sales were reported either down or stagnant. Overall Sales Trends – Survey participants where asked to provide the overall percent that their sales were up or down as compared to the same period in 2015. Once again, the results presented us with a mixed bag, with almost 30% of respondents indicating their sales were down between -1 and -30%. Sales Trends by Departments – One of the more revealing questions of our Business Climate Survey asked participants to indicate the percent sales were either up or down in six key departments in our industry. 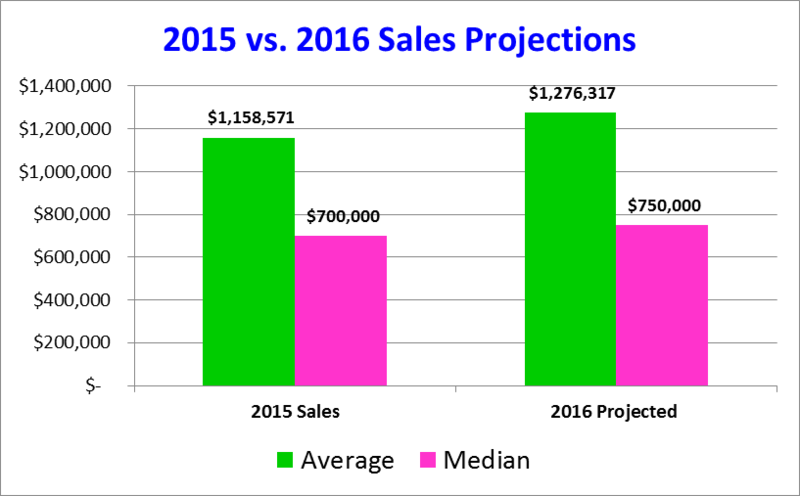 The following graph reveals the projected sales growth in these six areas. 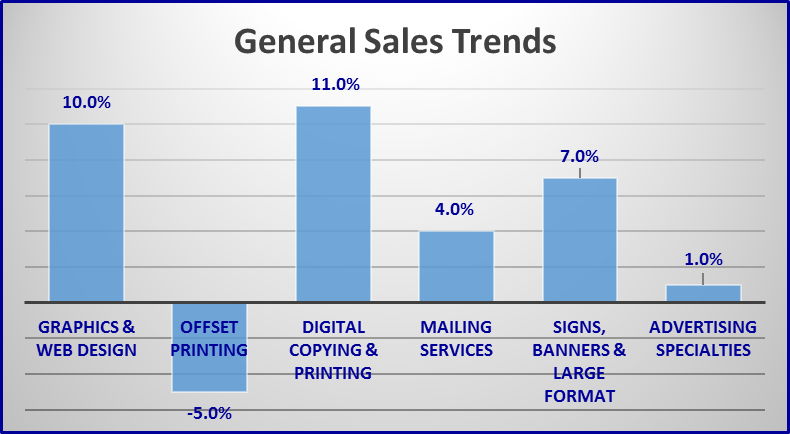 No surprises here for most folks, with offset printing showing a projected decline of -5% while digital copying and printing services showing a projected increase (according to respondents) of 11%. 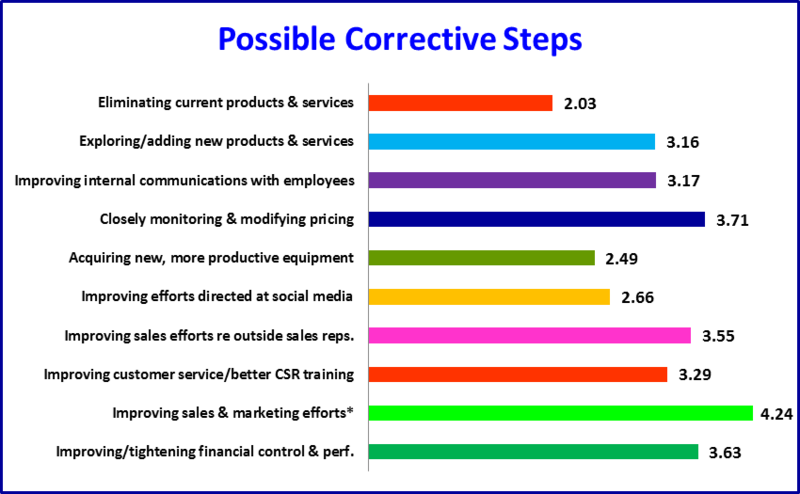 Prioritizing Corrective Steps to Improve Sales – So, what corrective steps are most folks taking to improve their sales and profits in 2016? We asked survey participants to prioritize each of ten possible corrective steps that could be taken in 2016 to improve their overall financial strength. We asked folks to prioritize the possible steps by selecting one of the five choices – Top priority, high priority, average priority, moderate priority or low priority. Responses were weighted and then we graphed the results. See the graph below. As you can see, “Improving sales & marketing efforts (excluding outside sales reps)” received a significantly higher priority (4.24 weighted score) than any of the remaining nine choices. One must remember, however, that simply because the majority is taking one specific step or concentrating in one area doesn’t mean that is the correct step for your firm to take. As an example, you may already be doing an excellent job in the area of social media and marketing efforts, but your profits and overall productivity can still be far below average. If the latter is the case, taking a closer look at when you last raised prices or increased your sales per employee by acquiring more productive equipment might be the better choices. First, we truly appreciate the participation of the more than 135 firms that participated in this survey. We apologize if we bugged some of you too much with all our repetitive reminders, but that is the only tested and proven method for getting the best response rate possible. We hope you enjoy and benefit from surveys such as this. Second, as always with surveys of this type, they tend to present both “Good News” and “Bad News” depending upon who the reader is. While we report that almost 30% of respondents are reporting or projecting negative sales growth for 2016, another 37% are projecting sales growth rates of 7% or higher! If you are in the bottom 30%, you can at least take modest comfort in knowing you are not alone. Third, we want to suggest that simply reading this report, as well as some of the other valuable reports and surveys we publish on behalf of the industry, is simply not enough. You MUST ACT! It is great to remain informed about your business and your industry, but you must also act and adopt a plan of action to deal with the challenges facing your company. If your sales are down maybe you are following the wrong track or worse, maybe you are failing to act at all. Attempting to pursue and improve “offset printing” sales when other areas offer far greater promise may be the wrong path to follow. Failing to raise prices or terminate a marginal employee when all the facts point in that direction can be fatal for your business.